Today will feature mainly cloudy skies across the area as well as the chance for showers in south western areas. Look for showers trying to work into southern areas but dry high pressure to the north will keep any steady or heavy rain confined to far SW NH and points SW. Far NE areas are likely to stay dry and could also see some sunny breaks as high pressure remains in control. For the rest of the area, we’re in the battleground between high and low pressure which means cloudy skies and on and off drizzle/light rain can be expected. Temps look to remain cool as clouds and onshore flow prevent any significant heating. The warmest temps will be found in NE areas where at least some sun is likely to get through. Highs there will likely rise into the upper 70’s to near 80 while SW areas under the influence of onshore flow and cloudy skies will likely stay stuck in the upper 60’s to low 70’s. If this were December, we’d have quite an interesting setup tomorrow. Sadly, it’s the end of July which means that instead of a fascinating concoction of rain, sleet, snow, and ice, we will be experiencing a dull, cool, drizzly, cloudy, showery day. Low pressure to the west will try to sling some tropical moisture our way but dry Canadian high pressure will be playing goalie and doing a fairly job blocking any shots of heavy rain thrown our way. The end result will be a day where conditions will vary greatly depending on location with the nicest (least dreary?) weather north and west and the worst (least nice) weather south and west. A weak area of low pressure is currently drifting NE out of the Ohio Valley and into western PA. A warm front extends out ahead of it into Southern New England while a cold front trails it into the Midwest. Most importantly for our forecast is the high to the north. That high will constantly feed cool, dry air into the region as tropical moisture tries to stream north (as I said, if only it was December!). If upper level winds were strong enough and the flow amplified (wavy) enough, it might not matter but a look at this morning’s upper air analysis reveals why our chances for a super soaking are super low (if not zero). Winds aloft over North America are still generally blowing out of the WNW. 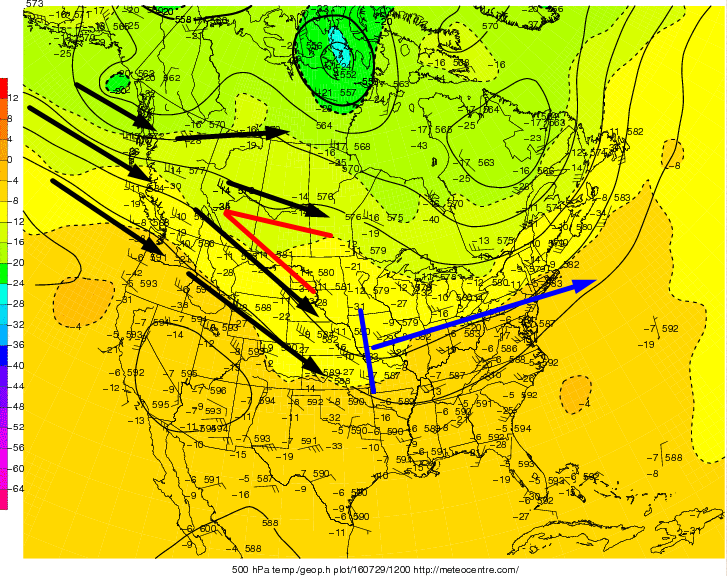 This is slowly changing as a disturbance drops south into the Pacific NW (that disturbance (red line) may bring showers and storms next weekend) but for now, our disturbance for tomorrow (blue line) still has little room to amplify and move north. The lack of strong upper level forcing means that the dry high pressure over northern Maine will likely win the day and prevent any steady, heavy rain from impacting Northern New England (southern New England has a better chance at heavier showers/storms as they are closer to the moisture). That doesn’t mean that you’re good to go the beach though, we likely do see at least some rain. This map is valid at 10 AM tomorrow morning and is showing light rain/drizzle over SW ME and most of NH with heavier rain towards SW SNE and the Mid Atlantic states. Drizzle/light rain and fog are likely to be the name of the game tomorrow as onshore flow develops in between the high to the north and the low to the south/west. Aside from lots of drizzle/light rain, not a lot is expected to happen outside of southern NH and perhaps York County Maine. In that area, pockets of heavier rain are likely with a rumble or two of thunder possible. In terms of total rainfall amounts, a general .1 to .25″ is likely SW of the black line. NE of the black line, lesser amounts are likely with many far northern areas getting little or nothing in terms of rainfall. Some pockets of a half inch are possible across SW NH with up to .75″ possible if any downpours develop and decide not to move for a while. While this rain is better than nothing, we will need something a lot bigger to erase our 3-6″+ deficit and the accompanying moderate/severe drought conditions across SW areas. The best way to get that rainfall in the summer would be through a tropical system of some sort. There are a couple weak disturbances down in the tropics that I am keeping an eye on but it is highly unlikely we see any tropical drought easing in the next 10 days. Our next chance for rain will arrive next weekend when the disturbance over the Pacific NW moves across Canada and joins up with the remains of a storm currently south of Alaska. I’ll be watching that this week and will have more updates as we get closer. I’ll have a morning update tomorrow but will be heading to Boston for much of the afternoon and thus won’t have time for an evening update. Today will feature mainly sunny skies, cooler temps, and lower humidity. A lovely day is in store across the area as temps climb to right around 80 before a sea breeze cools things off at the coast. Farther inland, temps will remain in the low 80’s. Dew points will be settling into the comfortable range as light NW breezes bring in dry Canadian air. Skies will be mainly sunny with just a few late day clouds possible in western areas. Enjoy it! More clouds and showers are possible tomorrow. A leftover shower is possible tonight as another cold front rolls offshore but other than that, the next 24-48 hours look to be a continuation of our recent dry pattern. Highs tomorrow will be in the upper 70’s to low 80’s under partly to mostly sunny skies. Cooler temps are expected for Sunday as more clouds and possibly showers are expected to roll in. How many people saw rain today? Not a lot. 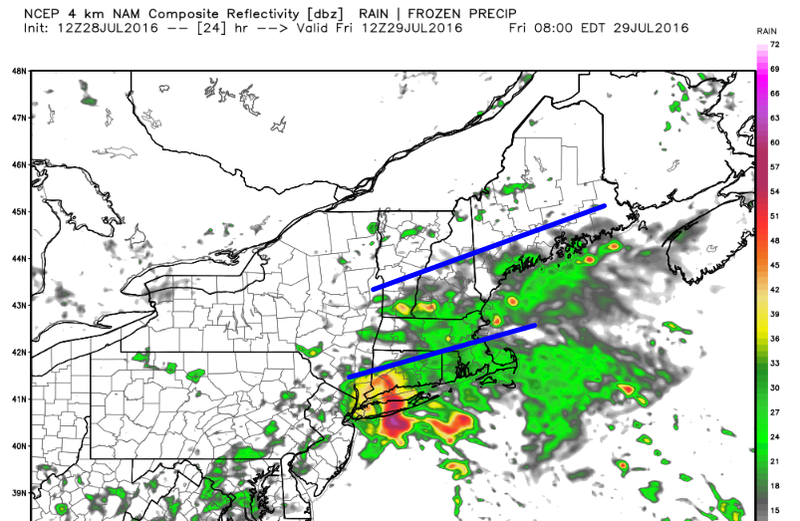 The drier GFS scenario worked out as a cluster of thunderstorms south of Southern New England kept any significant moisture too far south for tropical deluges in Southern New England and too far south even for light to moderate rain for Southern Maine. Some parts of Southern NH did get a period of much needed rain this morning but much more will be needed to erase the current rainfall deficit which is in the 3-6″+ range. 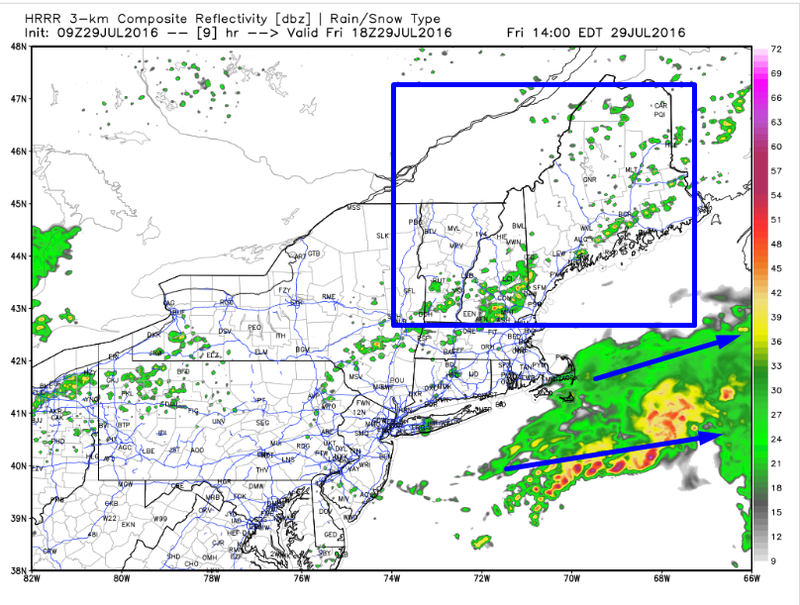 Will we get another chance at rain here in Maine and New Hampshire? Guidance is hinting at more rain Sunday into Monday but I’m skeptical for the same reasons I was about this morning’s event. Most of these doubts stem from the pattern we are currently in across North America. The general pattern across North America is dominated by upper level low pressure from the NW Territories to Northern Quebec/Labrador. A heat dome is located over the SW US and a subtropical ridge extends to the east of that into the Atlantic and west into the Pacific. 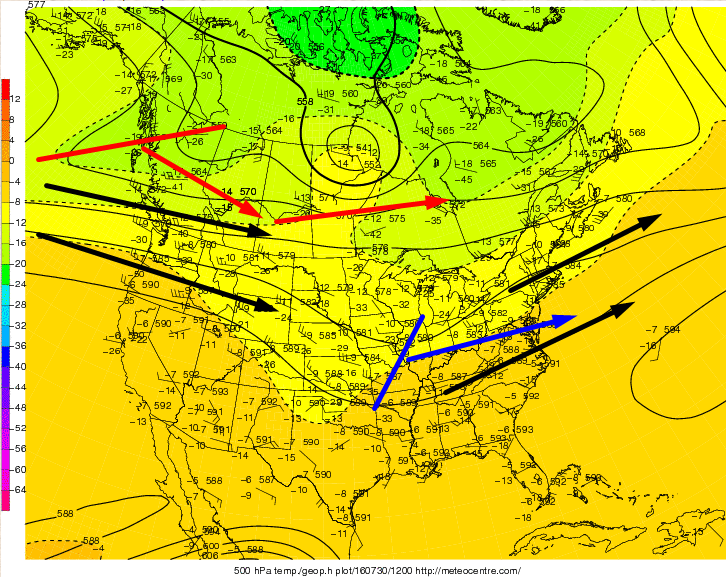 The reason that low pressure in the Yukon and High pressure in Arizona is important to us in Maine is that in between those systems, the winds are primarily out of the WNW (black arrows). 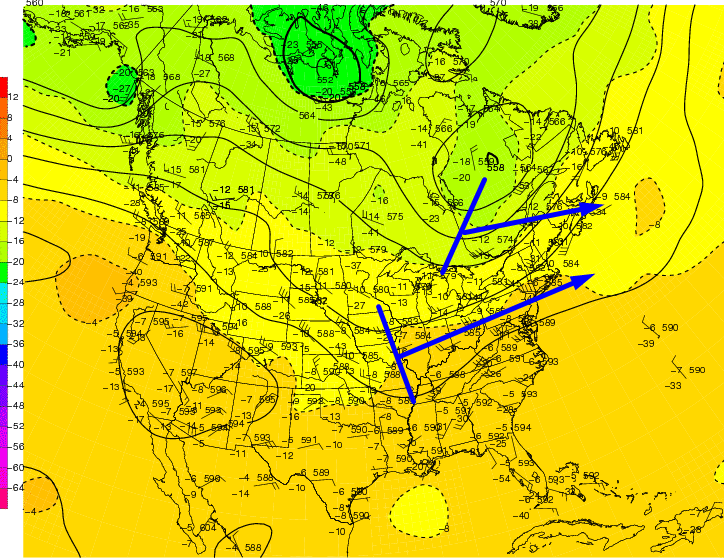 The disturbance to be watched for Sunday/Monday is the blue line over the central US. Guidance indicates that it will drift NE and intensify as it approaches us. I don’t fully believe the degree to which the models are amplifying it because the pattern indicates that it will tend to zoom south and out to sea just like the disturbance before it did this morning. Now, I do believe we have a better chance of rain Sunday/Monday than we did this morning because of the little pocket of calm winds this disturbance is currently sitting in (red lines). The NW flow is being diverted around the disturbance and so it won’t feel the full effects of the NW winds. This makes me think that we have a better chance to get at least a little moisture up here, perhaps enough to drop a quarter or half inch of much needed rain in the form of widespread showers or possibly even some steady rain. More details will become available in the coming days and this remains a fairly uncertain forecast so if you have outdoor plans Sunday or Monday, I would simply keep an eye and ear out for the latest info in the coming days before making a decision. Today will feature mainly cloudy skies as we sit in between two fronts. 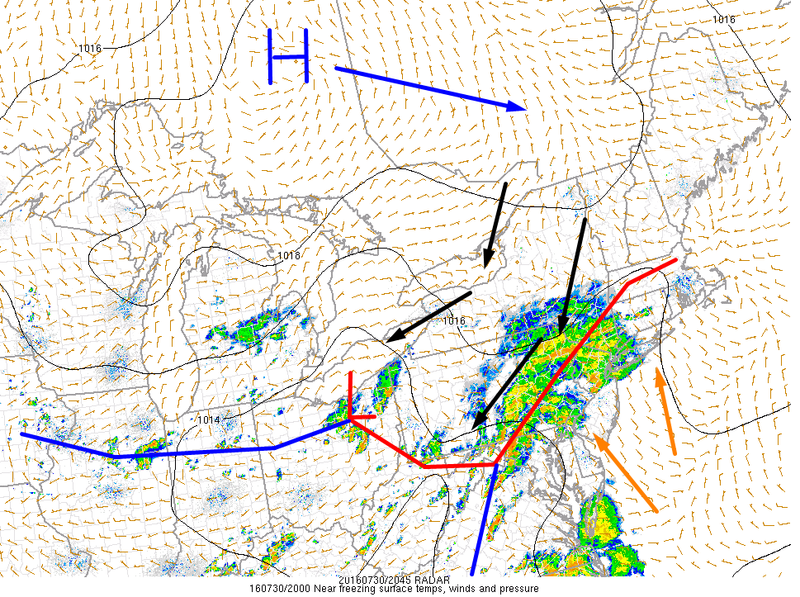 The front from last night is stalled just offshore and a low is developing on its southern end just offshore of NYC. That low will scoot ENE today and we will be on its far northern fringe. It will bring the chance for showers this morning especially along the coast and across the southern half of NH. It will be moving out by early afternoon if not before. Here is the 7 AM observed satellite/radar along with surface winds to show the fronts. 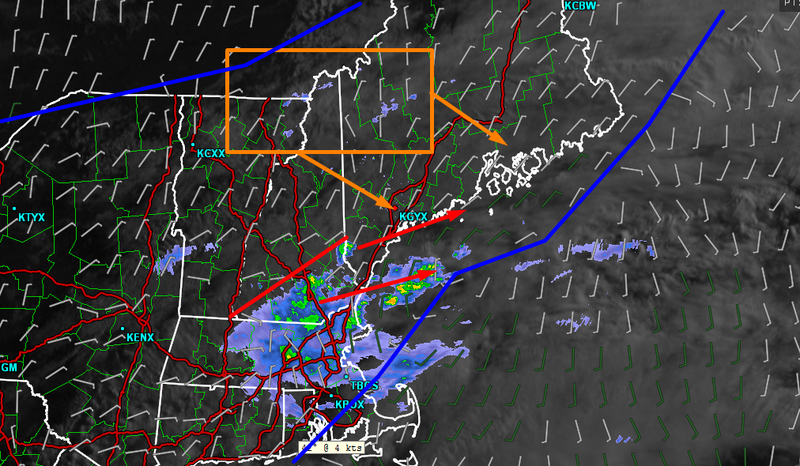 As you can see, there are showers across southern NH and far SW ME associated with the southern front/surface low. Also note, however, that there are a few sprinkles popping up ahead of another cold front that is drifting in from the west. These sprinkles will become more numerous as the day goes on with a few full fledged showers and possibly an isolated thunderstorm expected by afternoon. 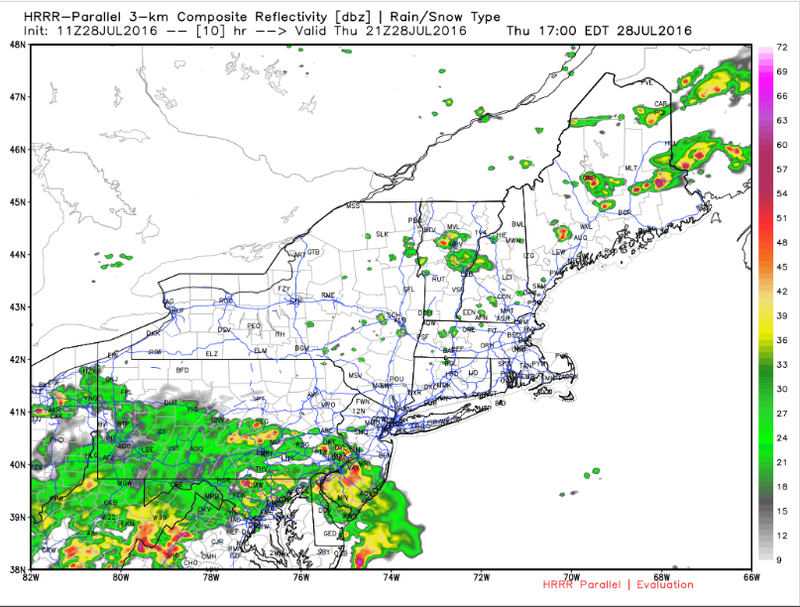 The HRRR model does a good job of showing the general setup this afternoon with scattered showers and storms across the area at 2 PM. Don’t look at models like this to determine exactly which town a storm will hit (that’s impossible), but do look at them to get an overall idea for what the setup is. 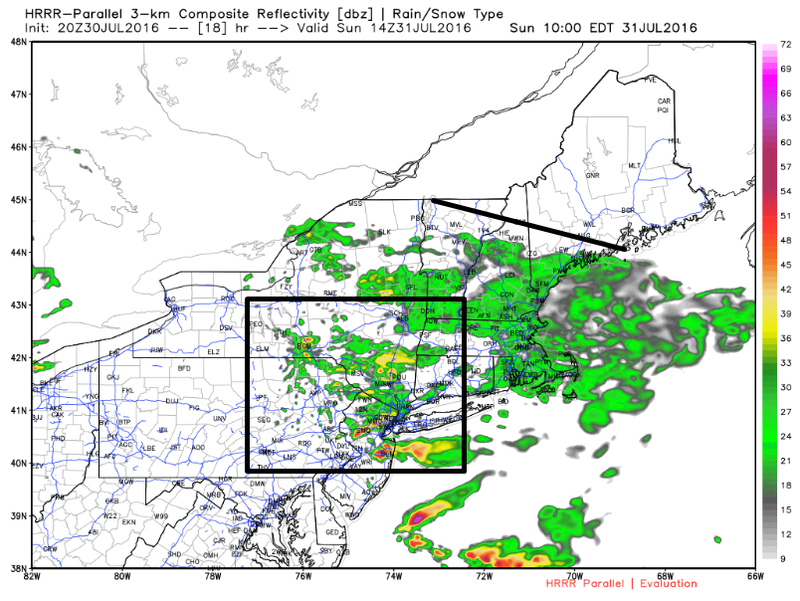 In this case the setup favors scattered showers possibly with a rumble or two in the stronger cells developing mid morning and slowly drifting towards the coast by mid to late afternoon. Some sun is also possible this afternoon and into this evening especially in NW areas. Highs will be sitting a few degrees on either side of 80 with fairly uniform temps across the area today. More rain is possible at some point either late in the weekend or early next week. More on that as we get closer. Showers and storms are ongoing across the region today with just a few managing to reach severe status with small hail and gusty winds. Showers and storms will diminish through the evening hours as we lose daytime heating. Some residual rumbles are possible through early tonight in southern areas but no severe weather is expected. The cold front responsible for today’s storms will settle just to our south tonight and low pressure will develop along it before scooting ENE tomorrow. Just like a winter snowstorm, there will be a sharp northern edge to the heavy precip where one town could see upwards of 2″ of rain while the next town over ends up with maybe a quarter inch. As of now, it looks like Maine will end up on the dry side of this line while MA, CT, and RI end up on the wet side. The battleground will be between Manchester NH and Boston MA. Those areas could go either way. The reason that heavy rain is not expected is that upper level winds are unfavorable for steering moisture to us. There is a disturbance currently located over Eastern Canada (northern blue line) that will move east tonight. Behind it, there will be WNW winds aloft. Those WNW winds will guide the disturbance with all the moisture (southern blue line) well to our south. We will still likely see at least a little bit of rain but no big flooding storms are in the forecast. The mountains are likely to stay mostly dry though a stray shower sparked by daytime heating cannot be ruled out. Along the coast, showers will be more numerous with a brief period of steady light to moderate rain possible. The heavy rain will be reserved for far southern New England with southern CT, MA, and RI possibly seeing up to 3″ of rain. Some guidance indicates we could miss out all together with only the chance for showers along the coast and nothing north. Right now, I’d plan on some drops tomorrow but a washout doesn’t look likely. Drier and cooler weather is likely to move in Saturday and there’s the chance for more wet weather next week though that remains highly uncertain. Today will feature warm temps, increasing clouds, and the chance for afternoon showers and storms. Showers and storms will begin to develop this afternoon over the mountains before moving south east across the area heading into this evening. They likely will be weakening as they approach the coast later this evening. The window for storms looks to be 1PM-12AM from NW to SE. Some storms could be strong but no widespread severe weather is likely. That being said, a stray strong wind gust or a few small hailstones cannot be completely ruled out. The greatest threat for any marginally severe storms will be in the northern mountains. Here’s how one model thinks it could play out this afternoon/evening. Look for scattered storms drifting slowly towards the coast. As I said, no widespread severe weather is expected but it doesn’t take severe wind or hail to make storms dangerous. Lightning is as big a threat as any so when thunder roars, go indoors. Highs will rise into the 80’s for most with some upper 70’s along the coast and in the far north. A sea breeze does look likely to develop this afternoon but otherwise, light southerly/south westerly winds are expected. More showers and storms are likely tomorrow.